Rock painting is so much fun! Rocks are plentiful and the perfect canvas for miniature works of art. There's rock hunting groups too, so you can hide painting rocks and find them around your city. They bring a smile to all that see them. 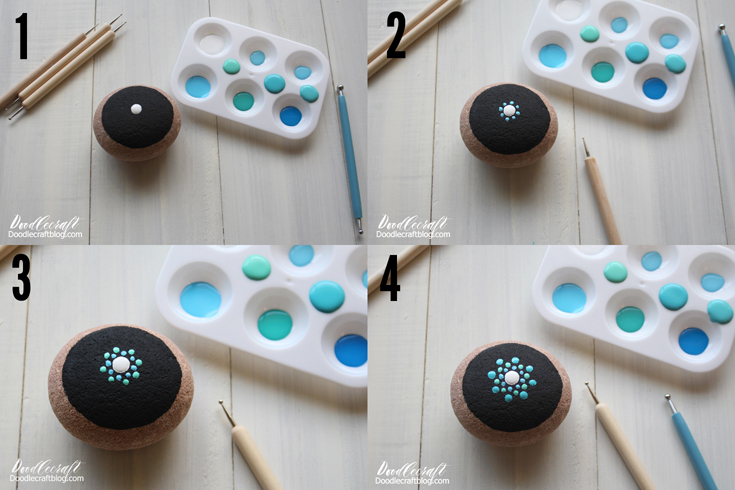 Dot painting is a simple way to get started and just takes a few supplies. 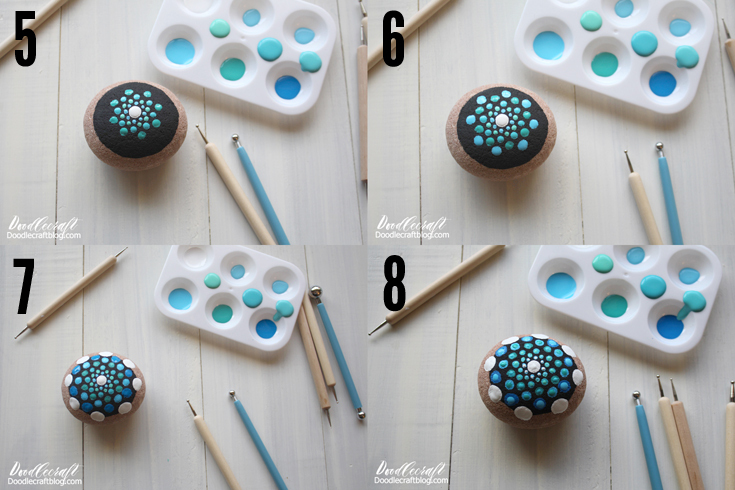 Begin by painting each rock with a large circle in black. Leave the edges of the rock still showing. Then get a variety of colored paints ready to rock! Begin by using the lightest color you have, in this case white. #1. Put one large white dot in the center (ish) of the rock. #2. Then go to the next shade and add 8 dots around the center dot. #3. Next add another circle of dots by placing them in between the dots of the first row. #4. Next row of dots...each time making slightly larger dots. #5. Add another row of dots, leading to #6, the same thing but slightly larger dots. #7. Now add 8 more big white dots--half way on the black circle and half way on the plain rock. #8. Now add smaller dots in the center of each dot, in the color of the row previous to it. Add some dots trailing off each dot on the edge and a couple of layers of dots in the white dots. I think they look like eyes! Do a similar technique with bright colors! Rainbow colors are my favorite...just adding dots one at a time makes such a fun rock! Once the paint is dry, give them a light coating of clear sealer spray. Let the sealer dry and they are ready to hide or put in your yard for a fun decoration! I love them! Which one is your favorite? 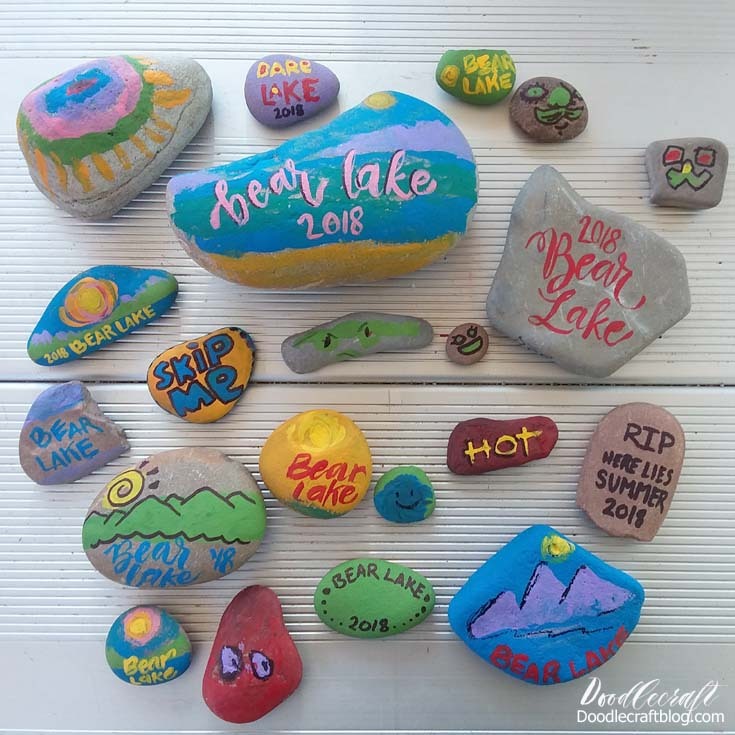 Check out these painted rocks too! So cute. I can make it for my kids. Wonderful DIY tutorial.